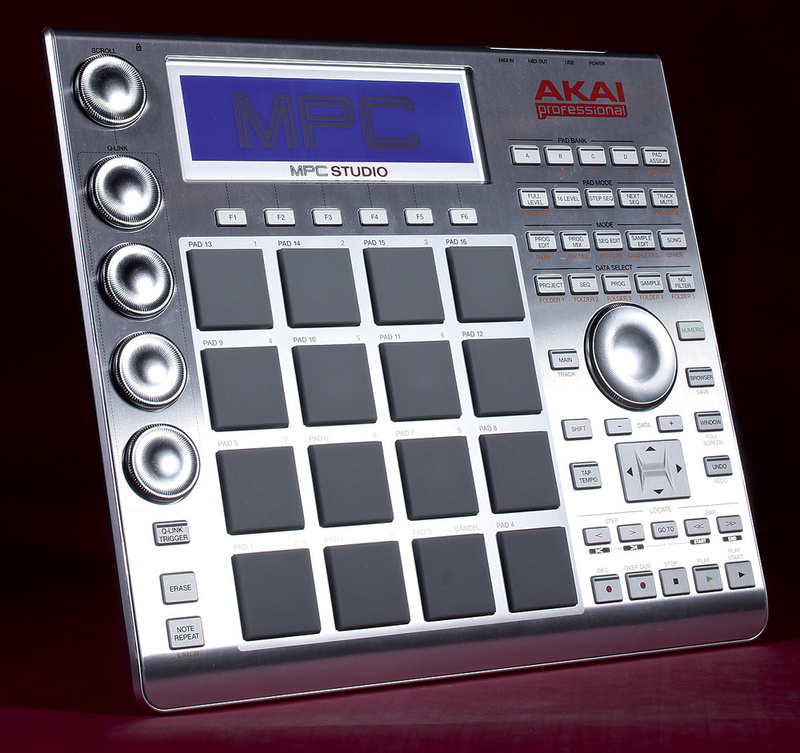 It doesn't seem more than five minutes since I was exploring the hefty chunk of real-estate that is Akai's MPC Renaissance. That next-generation hardware/software MPC has a built-in audio interface and broadcasts on multiple MIDI channels, but for those already happy with their sound card, or for whom portability is paramount, there's now a second, less expensive controller for the same MPC host software. The MPC Studio is sleek, silver and slender, its reduced girth putting it neatly into the laptop-bag zone. Weighing in at around 900g and measuring 284 x 257 x 22mm, the MPC Studio is strikingly flat. Like a supermodel fed on a diet of cress and cocaine, it practically vanishes when viewed side-on. In one sense, this threatens to become a triumph of style over common sense, because the five stunted encoders are never particularly grippable, even though their action is smooth enough. Of course, mapping your favourite VST plug-ins to a mere four Q-Link controls is never going to match the Renaissance's opulence, but it's not as bad as you might think: a quick spin of the Scroll encoder conveniently selects which of the four vertical rows of parameters are live; and the main data encoder is larger and can be turned reliably with a fingertip. There's hardly any wasted space on the low-profile, brushed-aluminium panel, but the matrix of backlit drum pads grabs the lion's share, leaving a multitude of buttons jostling for what's left. To accommodate the functionality of the much larger Renaissance, the buttons have had to shrink down and huddle together, but with practice you should hit the correct one more often than not. Most buttons include coloured LED-type strips, which helps. Button action is disconcertingly squishy, but is accompanied by a reassuring click. Unlike that of the Renaissance, the screen can't be tilted to suit different working angles, so a stand of some kind for the entire controller would be a useful accessory. The screen (360 x 96 pixels) is blue and bright, and it responds fairly snappily to the various means provided for updating values. These include the aforementioned Scroll and Q-Link encoders, as well as arrow keys, the data encoder and six soft keys. With just a single USB cable connected, you can play the Studio easily from your knee, for that computer-free feeling. The rear panel is super-minimal, but finds room for an on/off switch and a single set of MIDI ports. They aren't standard, though, because the unit isn't deep enough. Instead, Akai have fitted two 3.5mm sockets and included a couple of short conversion leads to translate them into regular five-pin females. Provided you don't misplace them at a vital moment, they should do the job admirably. Also supplied is a red carry case to protect the MPC Studio during transit, but this misses a trick by omitting a compartment for cables. Power is supplied via USB. Hardly a back panel as such, the rear of the MPC Studio features just a power button, USB port and MIDI I/O on 3.5mm jack sockets. The Studio, like the Renaissance before it, acts as a controller for host software running on a PC or Mac. If you refer back to the Renaissance review in the February 2013 issue of SOS for the details, we can concentrate here on what came next. Since February this year, the software has continued to advance, the current version being 1.3.1. I'm happy to report that genuine progress has been made, with the biggest fix addressing the most urgent issue. This concerned the way plug-ins were handled, which was badly. Since 1.3, the software no longer generates separate copies of each plug-in for every sequence, saving resources by the bucketload. 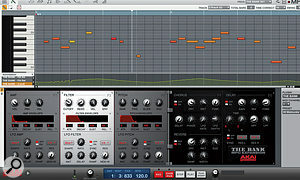 Furthermore, the same plug-in can be used on multiple tracks. Indeed, this is the expected behaviour. 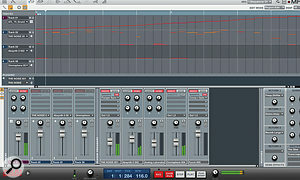 A new track starts with the same program and plug-in as the previous one. Therefore, if your plan is to work with an entirely new instrument, it's best to select a new program before selecting a new plug-in. Get the order wrong and you're assaulted with warning messages about disrupting earlier tracks. 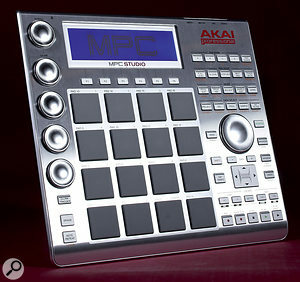 A program is Akai's term for a complete collection of samples, and the MPC can host 128 of them. Since you can put samples on every pad and there are eight banks of pads (A-H) to fill, you have the capacity to build some of the world's most humongous drum kits! The efficiency upgrades continue with a welcome change to the way tracks are viewed. The MPC has a generous 128 tracks, and although I'm the last person to obsess about tidiness, I really appreciated being able to pack away those that weren't in use. Next, I noticed that the much-requested hardware zoom had been implemented. 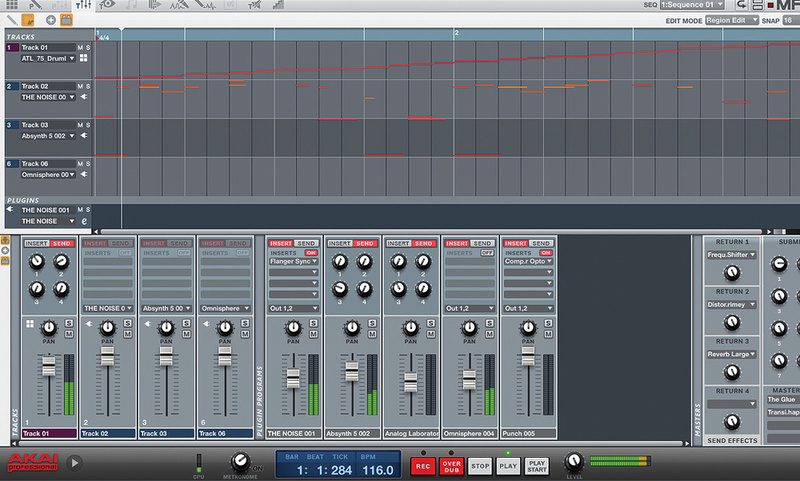 Using shift and the cursor keys, you can dig deep into the nitty gritty of sample waveforms. Strangely, the Studio's own display doesn't zoom, so you're still forced away from hardware to enter mouse territory. The hardware's display looks capable of zooming. It's larger than that of my Elektron Octatrack, for example, and that copes fine with sample editing. Turning next to features demanded by users of various legacy MPCs, I can report but can't verify that the import of MPC2000 and 2000XL files has been added. I couldn't test the improved MPC3000 file handling either. At this point, I began to feel a bit left out, because there's a new vintage emulation mode, too — exclusively for MPC Renaissance users. This is 'SP1200 Ring', a reminder of those guilty 12-bit sampling pleasures. It's a pleasure out of bounds to MPC Studio owners, though, because the vintage modes insist on the audio hardware found on the Renaissance. Hiding unused tracks in the MPC software. Sometimes it's the little things...Returning to improvements we can all enjoy, this version introduces the option to sample at 16- or 24-bit resolution. Audio export has been fleshed out, too, and now supports export of submixes and of consolidated WAVs from multiple plug-in tracks. This generates samples to be imported into your DAW, but as yet there's no way to drag and drop audio directly into an arrange window. In fact, the audio export options aren't available while the MPC software is running as a plug-in. At least the prospect of doing that is more realistic, thanks to increased software stability. Scrolling through the remaining enhancements, some are minor, others operational, and some seem insignificant, but could still bring appreciable gains. From its new batch of icons to the ongoing upgrade program for the track view and automation lanes, the host software simply looks better and more professional. With luck, it will eventually shed all its residual awkwardness; for example the 'Seq Edit' button has no software equivalent, yet it remains the go-to page for sequence and track copying and other common operations. Rounding up this batch of OS tweaks, Akai's bundled plug-ins have been born again to make them directly accessible from the Program Edit page. Their every parameter is visible without the need for a separate, floating window. Similarly, plug-in selection is no longer a disorganised list; you can browse by type and plug-in manufacturer. However, some customisation of both the organisation and view would still be welcome. Unsurprisingly, there's still work to do. The software remains 32-bit (64-bit is scheduled for the 1.4 release) and classic MPC features such as Step Edit are yet to be seen. There are also functional quirks to address, assuming the aim is to convey a hardware-like experience. For example, stopping the music to save the project seems (just about) acceptable, but it's restrictive to have to hit stop before entering Song mode. Even if it runs counter to MPC 'workflow', I'd have liked dedicated buttons for mute and solo, as well as at least one volume control, but I guess there was simply no room on the Studio. 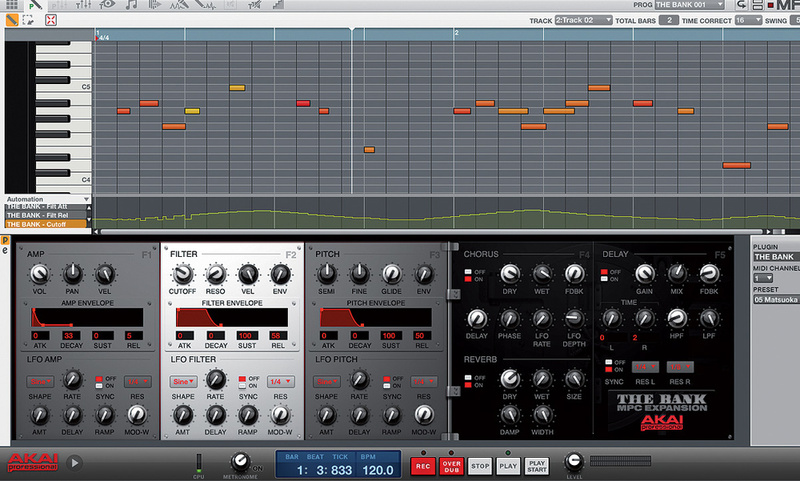 I experienced just a couple of crashes, and on both occasions with fairly obscure plug-ins. Occasionally, I received a message ordering me to attach the controller, even though I'd been happily using it all afternoon. This mainly occurred while running under Logic, the software informing me that it would run in demo mode even though it continued to be fully functional. The MPC Studio ships with the same 9GB of sample content as the Renaissance, but includes only two of the four expansion instruments. Fortunately, these are the most useful two (The Bank and The 809), and there's also that large collection of classic MPC samples and loops to wade through — plus all your plug-ins and effects, too: don't forget those! The bundled instruments are neatly integrated into the MPC software's Prog Edit page. Low-key, portable and strokeable, the MPC Studio has a comparable aesthetic appeal to an iPad, and it slots into a setup with minimal impact, because it uses your existing audio interface. Unfortunately, this currently rules out the various vintage emulation modes, unless Akai can develop software-only versions. Compared to the Renaissance, the main drawback is the Studio's knob sparseness. Those four vertical Q-Link encoders didn't grab me — or, rather, I frequently failed to grab them! The Studio also lacks the immediacy and ruggedness of MPCs of yore; the buttons don't inspire massive confidence, although the pads take a good whacking with no suggestion of compromise. Maybe an angled stand could lend it more of a substantial feel — and better visibility of the display. Akai resisted the obvious trick of positioning knobs under the screen, like NI's you-know-what, but that idea might have worked nicely. There's no denying that the Studio feels markedly different to use than its big brother. Perhaps because of its reduced dimensions, it never conjures an illusion of hidden components, whereas the robust hardware of the Renaissance provides a credible impression of a traditional MPC. Not that tradition is everything: branching off for the sake of portability opens up fun new avenues and, in the Studio, you have the functionality of the larger machine in a seriously portable package. It's easy to imagine that, in the future, an MPC could replace your DAW entirely. It would need to include audio tracks, full effects automation and some of the real-time time-stretching capabilities we've come to expect, but if Akai did choose to head in that direction, it suddenly feels achievable. In an ideal world, the current version would have been the first version of the software available to the public. It's stable, smooth and pleasant to work with, which should make waiting for fixes, updates and favourite MPC features more bearable. As a general feeling of trustworthiness crystallises, it's safe to say that the MPC transition to a software base has finally happened. Native Instruments' Maschine is the well-established alternative, its second generation of hardware making great use of colour and emphasising simplicity and live performance over full song production. Maschine is a 64-bit program bundled with desirable content, but Akai, with this latest MPC update, have demonstrated that they mean business too. With a large number of issues now resolved, the MPC Studio is the first serious threat to Maschine's dominance. It'll be interesting to see how both develop from this point. Mac: 2GB RAM (4GB recommended), Mac OS 10.6 or later, DVD-ROM drive. Windows: 2GHz Pentium 4 or Celeron compatible CPU or faster (multicore CPU recommended), 2GB RAM (4GB recommended), Windows 7 (32 or 64-bit), DVD-ROM drive. Review system: Mac Pro running OS 10.6.8, 12GB RAM, 2x2.66GHz Quad-Core Intel Xeon. DAW Host: Logic 9.1.8 in 64-bit mode. The MPC Studio's slimline controller is a more affordable alternative to the Renaissance that doesn't compromise functionality. Has become a very playable MPC for your samples and plug-ins, thanks to improvements in this version. Increased compatibility with earlier MPCs. Software is still only 32-bit and single core and lacks some MPC favourite features. The Studio's small buttons and stunted encoders can't be described as luxurious. The MPC Studio is Akai's latest hardware controller for a software brain that rules the plug-ins and samples of your PC or Mac. Far more convenient than the larger Renaissance, it's the MPC built to travel.